One of the top boats at Los Sueños Marina in Playa Herradura is this 36ft Hatteras powered by twin Caterpillar inboard diesels. Completely rebuilt in 2002 and overhauled in 2012, she has fully bilingual Captain Esteban Marcos at the helm. 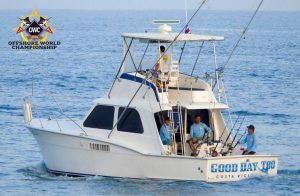 The boat finished second among 67 boats at the 2016 Offshore World Championship in Quepos. She has 48-mile 25KW radar to find the birds, a brand new a/c salon, a full head and shower, and Lee’s fighting chair and outriggers. Equipment includes conventional 30, 50 60 and 80 tackle; light 10, 12, 15 and 20 tackle; and fly fishing tackle such as #13 Sage rod / Billy Pate reels / #14 Thomas & Thomas rod and Orvis reels, plus marine radio and digital depth sounder. She will also go to Pez Vela marina in Quepos for multiple days.